Thanks for more than 3 million views of our Greece photos! 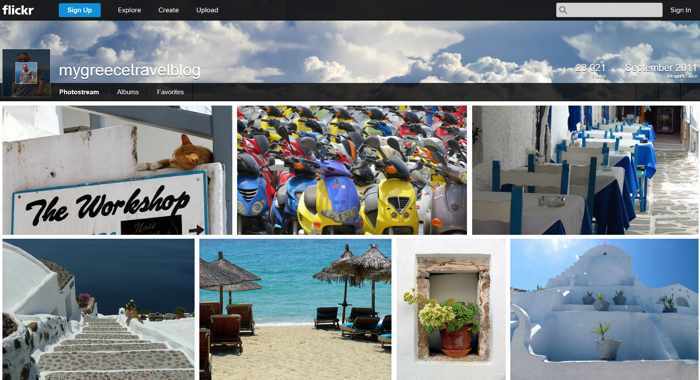 Thanks in large measure to readers of this blog, the MyGreeceTravelBlog photo collection on Flickr reached a major milestone this week, surpassing the 3,000,000-view mark. A few surprises were in store when I checked Flickr’s viewing statistics for the photos this week. I also was amazed that our set of 18 albums from last year’s trip to Syros was the most popular individual collection on our Flickr page. I had been expecting that our Mykonos collection would be the most viewed, but people seemed to prefer looking at pics of Syros. 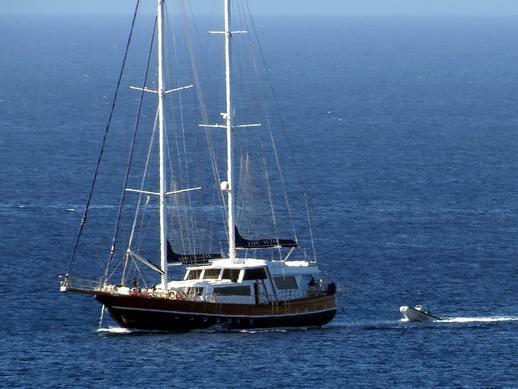 (You can access the Syros photos by clicking here.) Mykonos did claim the #2 spot, though. 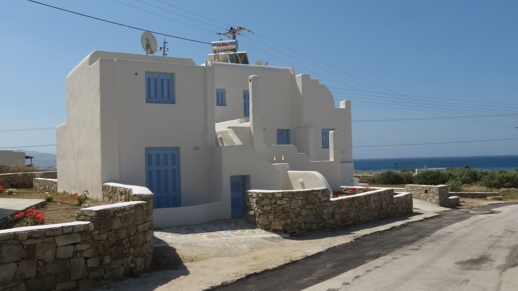 So far, there are album collections for 13 islands — Amorgos, Astipalea, Crete, Folegandros, Ios, Milos, Mykonos, Naxos, Paros, Patmos, Samos, Santorini, and Syros — plus one set with photos of many (but not all) of the hotels we have stayed at during our Greek holidays. More collections, including one for Athens, are in the works. Click here to access the main Flickr page showing cover pages for all of the album collections. Thanks very much for viewing the photos, and please feel free to comment on any of them at any time. Our photo sets of Syros had the most views of any collection on our Flickr page. 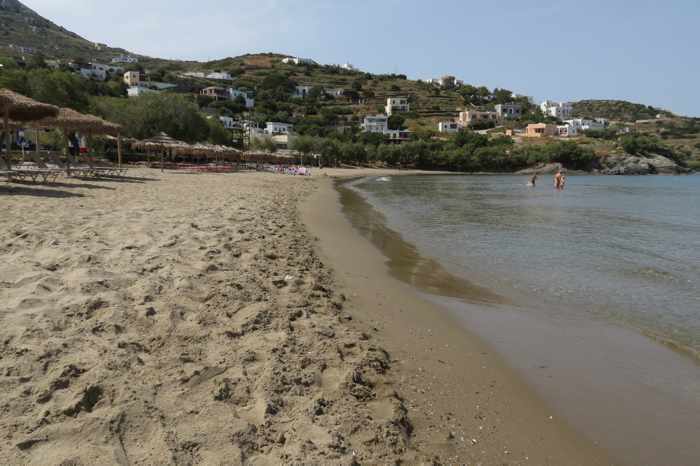 They included shots of Kini (above), our favourite beach resort on Syros. 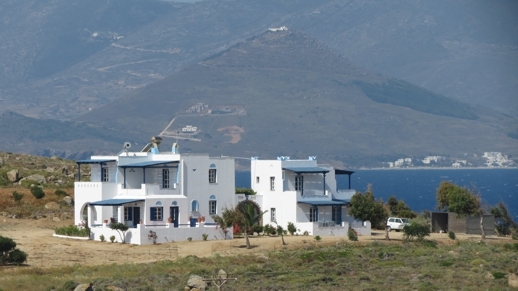 Cape Agios Prokopios view toward a recently-built residential neighbourhood on the west side of Stelida mountain. 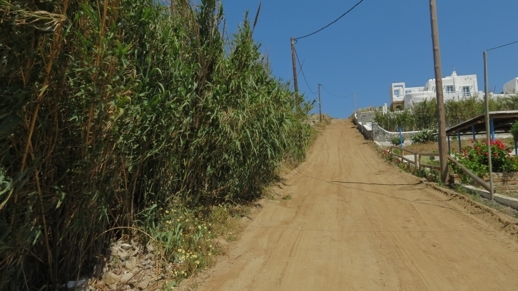 We walked a coastal trail below the houses and followed a dirt road back to Agios Prokopios beach. Final full day: Time passes far too quickly when we’re on vacation! We were completely relaxed and feeling right at home on Naxos, but already it was our last full day on the island. 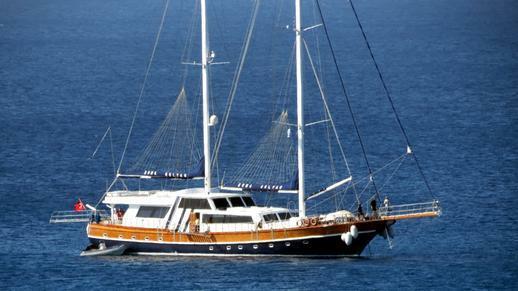 After breakfast tomorrow we would have to pack, check out of the hotel and get to the port for our ferry to Syros. Where did the time go? 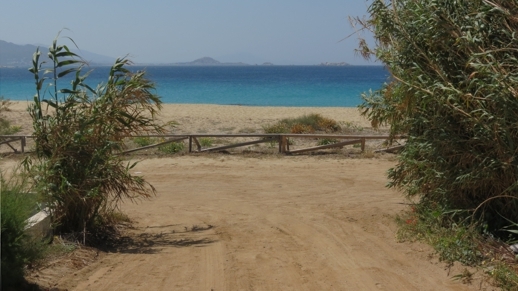 I had been certain we would see and do a lot more on Naxos than we actually did. 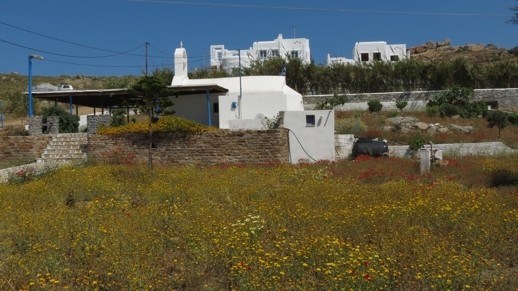 Before coming to the island, we had tentatively planned to visit at least one village — Koronos and Apollonas were the likely candidates — and to mountain bike as far down the south coast as we could possibly go. Windy conditions forced us to scale back our biking plans, while this morning we simply didn’t feel like hurrying into Naxos Town to catch a bus and spend more than an hour riding it to one of the villages. I felt guilty that we didn’t get to scratch more Naxos destinations off our must-see list, but a whirlwind sightseeing tour could wait for a future trip — today we found it more important to unwind and take it easy. Although we felt lazy, we didn’t want to spend a day sitting around or laying in the sun — we needed to move around, but at a relaxed pace. So after breakfast we took a long, slow walk along Cape Agios Prokopios and the west side of Stelida mountain, eventually making our way back to the hotel. Click on the 2 in the link below to continue reading the trip report and view dozens more photos of the sights we saw during our hike. Kitesurfers challenge the wind and waves off Mikri Vigla beach on Naxos. We shot this photograph from our dune- and seaview table at Kontos Taverna. Click on the picture to view a full-size image. Hikes & bikes: Warm, bright and breezy would summarize Wednesday succinctly. Morning brought a clear sky, light breeze and warm temperatures that would climb into the high 20s (Celsius) during the afternoon. Our big decision of the day would be figuring out whether to just chill out and relax for awhile at the Lianos Village Hotel pool, do something more active like hiking or cycling, or do a bit of both. During our leisurely breakfast, Dan and I agreed to take a short hike along the coast in the Stelida area to get some exercise first, and then see how the rest of the day would unfold. So we left the hotel and made our way down the hill to the northwest end of Agios Prokopios beach, where we could access hiking trails on Cape Agios Prokopios from the end of the road near Avali restaurant. This telephoto image, shot from our terrace at Lianos Village Hotel, shows two white and blue apartment buildings on a hill overlooking the north side of Cape Agios Prokopios. That’s Paros island across the channel. 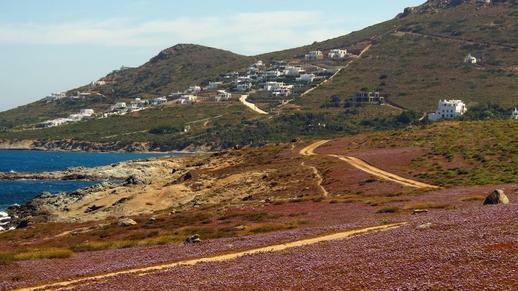 Walking trails on the Cape offer excellent views of the east coast of Paros. 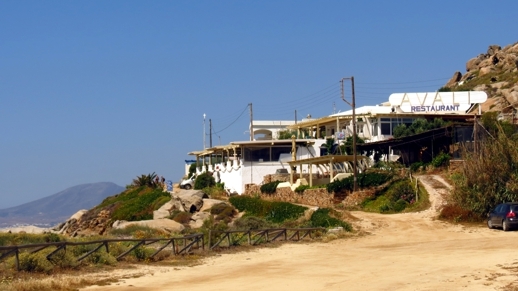 Avali restaurant is located on the hillside at the northwest end of Agios Prokopios beach. 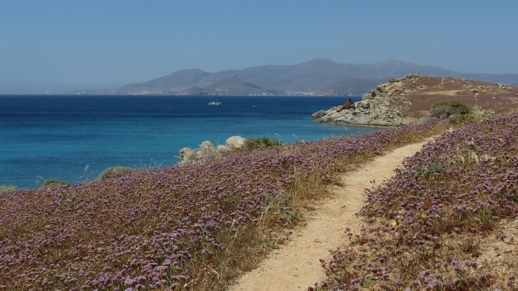 Walking trails on Cape Agios Prokopios can be accessed from the road that runs past the restaurant. Avali has the best beach views of any restaurant at Agios Prokopios; its seaview terraces are perfect places to enjoy the Naxos coastal scenery while having a drink or meal. 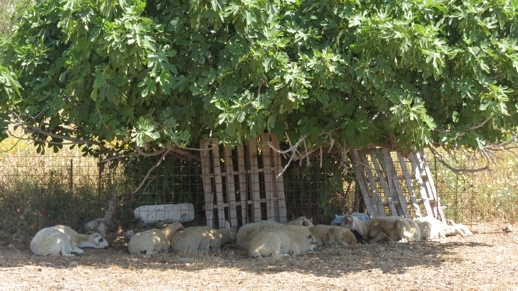 Please click on the 2 in the link below to continue reading and view dozens more photos from our day on Naxos. Ah, this is the life! A bikini-clad young woman catches some rays from the comfort of an air mattress floating on the calm waters at St George’s Beach. 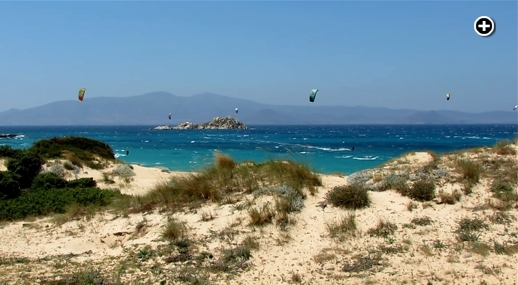 Naxos basked in gorgeous summery weather on May 20. Suddenly summer: When I woke up around 9 a.m., I almost felt scared to open the curtains to see what the weather was like. Would it be another day of clouds and rain, as had been forecast? Or would we get lucky and have a hint of nice weather instead? We got lucky! There was sunshine and a bright blue sky — an absolutely gorgeous morning. It looked like our spring vacation was starting off the exact same way our holiday had begun last fall — with clouds and rain our first day on Naxos followed by sunny clear skies the rest of the trip. I couldn’t wait to to have breakfast outside — our first outdoor meal since we were in Greece last October. I always love starting my day with a cup of coffee on the poolside breakfast patio at Lianos Village Hotel. 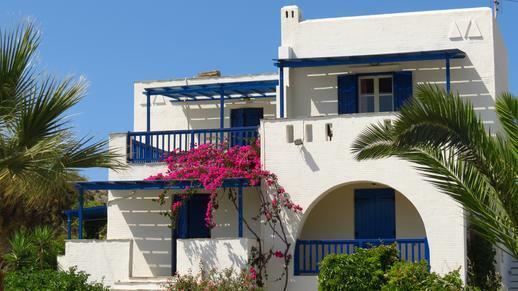 With colourful gardens and a swimming pool just steps from our table, views of the beautiful blue Aegean Sea, and a few of the neighbourhood cats lingering at our feet, the sun-shaded terrace is the place where I have enjoyed eating breakfast the most out of all our trips to Greece. 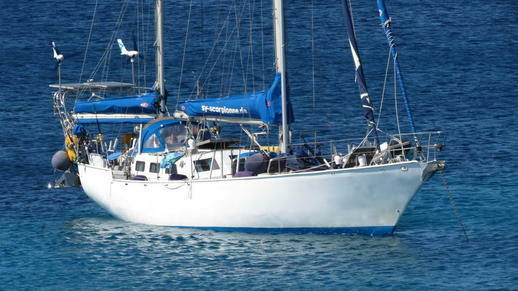 The setting and atmosphere make me feel completely carefree, content and relaxed. A little voice inside my head keeps repeating: “Kalimera! You’re on vacation! You’re in Greece!” I wish every morning could begin like this! 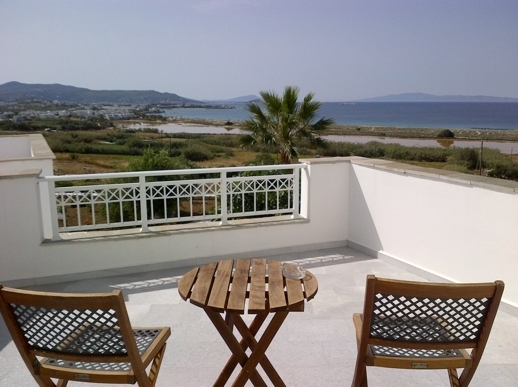 Sunshine and an almost cloudless sky greeted me when I pulled open the door and stepped onto our terrace our first morning on Naxos. This was our view looking south to Agios Prokopios and Agia Anna. Please click on the number 2 in the link below to continue reading my trip report and view dozens of photos from our day on Naxos.